Full calendar of upcoming stops through May 2019. RIO stands for Reading and Inspiration through Outreach, and the RIOmobile is essentially a library on wheels. On board, you can check out and return books, music, and movies, renew items you have checked out, pick up your holds, sign up for a library card, and pay your fines. The RIOmobile makes regularly scheduled stops on a weekly and bi-weekly basis at scheduled stops around the community. Do I need a Library card to check out materials from the RIOmobile? 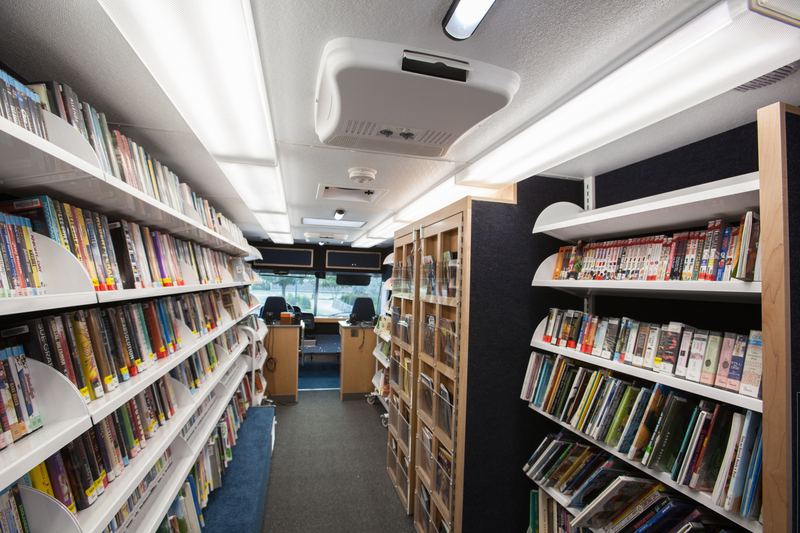 You will need a library card with the New Braunfels Public Library to check out most of the items on the RIOmobile. If you do not have one, you can sign up for one on the bookmobile, just bring an ID and proof of address (a piece of mail with your name and address will do). How long can I check out items from the RIOmobile? All items check out for the same amount of time as they would from the other Libraries. Do I have to return items checked out from the RIOmobile to the RIOmobile? No. You can return items checked out on the RIOmobile to either the Main Library or the Westside Community Center. Additionally, items checked out at those locations can be returned to the RIOmobile. My items are due, but the RIOmobile missed my stop. Will I be charged fines? If the RIOmobile cannot make its regularly scheduled stop, you will not be charged fines on any overdue items until the next scheduled stop. Can I pay my fines on the RIOmobile? Yes. We accept cash, check, and credit card. How do I place a hold to be picked up from the RIOmobile? If this is your first time placing holds on items to be picked up from the RIOmobile, you will need to tell us which stop you would like to pick your books up either in person at the Library or RIOmobile, by calling us at 830-221-4318, or by filling out the form in the box below. After you have designated what stop you would like to have your books delivered to, you can order holds online on our catalog as always, just be sure to select “bookmobile” as the location to pick up the hold. Can I have a hold be sent to another stop or to the library? To have a hold made available for pickup at a different stop or library, just call 830-221-4318. Please note that it might take a day or two to process these requests. The catalog says a book is located on the RIOmobile. Can I come to any stop to pick it up? The short answer is “probably?” Given the fluid nature of our collection, if you see an item in our collection you would like to pick up, just give us a call, and we can set it aside for you, or place a hold on it online. I want the RIOmobile to come to my neighborhood or community event. We periodically reevaluate and add new stops throughout the year. Contact Jonathan Margheim, the Outreach Librarian in charge of the RIOmobile at JMargheim@NBTexas.org or 830-221-4318 for more information.